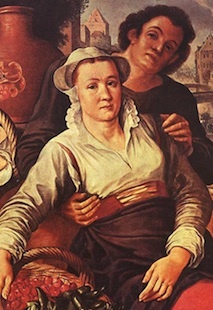 One of the most common styles of lacing in Medieval and Renaissance times was Spiral Lacing. This style of lacing uses only one length of lace to hold a garment together and to tension the piece. This is different from crossed lacing, which can use a single lace, but both ends are used to draw the two sides being laced together. This lacing style gives the impression of a zig-zag, across any gap between the two sides of the garment being closed. 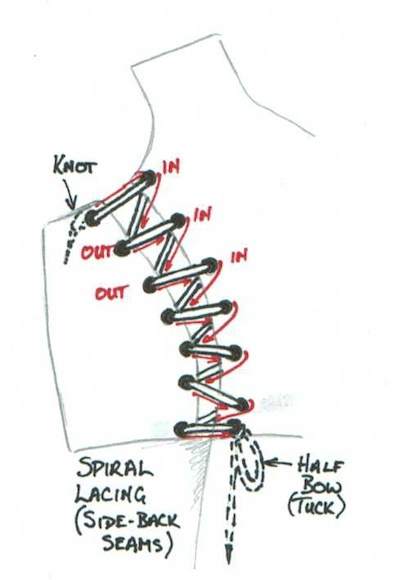 Spiral lacing can also be used to attach a removable or changeable sleeve to a garment at the armhole. While it is only used for a few styles of garment (Elizabethan arming jacks being one style, because the sleeves wore more quickly than the bodices), it is a secure way to do this. If the holes are close enough together, spiral lacing will leave no gaps. Examples of this lacing style can be found across many countries, from the 12th to the 16th century. The style seems to have fallen into less regular use from the 17th century onwards, as corsetry became more restrictive and needed the extra tension of crossed lacing to hold corsets together. It may also be that the style simply fell out of fashion. 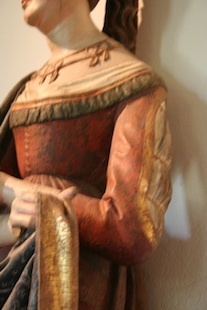 Common uses for this style are in Elizabethan bodices (all lacing placements), almost any style from the European continent in the 15th century and - most decoratively - in the wide-laced High German (Landsknecht, above left), and middle-class Flemish styles of the early 16th century (above right). 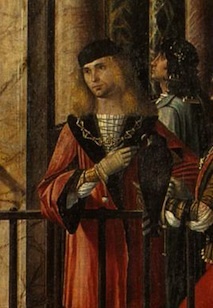 They are also to be found in many 15th Century Italian paintings (below right), and in Franco-Flemish styles such as the one in the statue (below left). Most examples of this style are seen as front, back or side-back bodice closures on both womens and mens clothing. You will need a lace 120cm long to complete the distance from waist to neckline, but will probably find that 80-90cm is sufficient to lace side-back closures (waist-to-armhole, pictured), or sleeves. My diagram shows hole placement. It is very important to have an even number of holes in between the top and bottom pairs, because you must start and finish on the inside of the garment. Knot one end of your lace firmly (or if you want to avoid losing the lace between wears, stitch the end firmly in place at the correct point). Starting from the inside of the fabric at the bottom right, pull your lace through your eyelet from inside to outside. Holding the end of your lace, cross over to the hole directly opposite, and insert the lace from outside to inside. Take the end of the lace diagonally up to the next hole on the opposite side, and pull the lace through the eyelet from inside to outside. Continue spiralling upwards from outside to inside and inside to outside in sequence until you reach the second last hole at the neckline. As for the beginning, cross directly over to the last hole and thread your lace through to the inside. 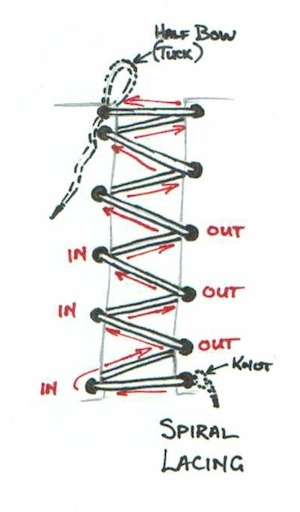 Continue to hold the end of the lace as you return to the bottom "rung" of the laced section, and pull up each rung to tighten the lacing to the desired tension. When lace is tensioned, tie the end into a half-bow at the top and tuck the remaining lace to the inside of the garment. For side-back lacing, start your lace at the top (left or right - mirror for each side of the garment). Should the entire gap be closed? Should a gap be left at the top, but not at the bottom? Does the gap widen and narrow over the distance? 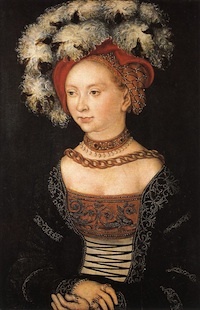 For Flemish and German styles - and for Tudor "jigger" lacing under the stomacher - note how the zig-zag already sits wide, but widens from the waist to the neckline. Let your eye on the paintings guide your fingers on the garment. Return from Spiral Lacing to Lacing.